Everywhere you look, opinions are divided on this set. Everyone is in agreement that Perlman�s brilliant technique is beyond reproach, but for some the romantic gloss in his interpretation or playing style seems to spoil the architecture of the music. There is also that switch between instruments � all but BWV 1003 and 1005 being played on a Guarneri, and the two mentioned numbers being completed on the Stradivarius which Perlman acquired while the project was ongoing. It is a little strange that the Guarneri recordings seem to have a greater halo of reverberation, while the Stradivarius Sonatas are drier, seemingly with a slightly closer and more intimate microphone placement. This is all a matter of taste, but with the �new� instrument the performances do at times seem to take on a more exploratory, searching character and some of the bravura seems to ebb here and there � although with the Allegro assai of BWV 1005 Perlman might have me eating my words. 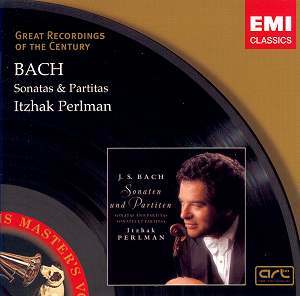 These works are among the greatest test for any violinist, and while Bach had featured strongly in his early recordings Perlman waited a long time before committing these works to record. Putting aside the arguments and taking the set on face value, it is easy to hear why it has had lasting popularity. For a start, the violin sound is set at a realistic perspective, making the sound pleasant and not in the least tiring. Compared to Shlomo Mintz�s athletic 1984 Deutsche Grammophon set it sounds almost recessed, but none the worse for that. Perlman knocks most of the comparable � I mean non baroque-specialist � recordings into a cocked hat in technical terms, and there is always something reassuring about having no worries about intonation and the like. I had another listen to one of the sets which has long been languishing in my hard-to-get-at CD cupboard behind the sofa, Lydia Mordkovitch on Chandos (1990) and re-discovered my disappointment in some of the rather sad sounding moments which sap the joy from airing such grand music over your loudspeakers. To be sure, this is the kind of set which you won�t be getting out at every occasion - Bach�s Sei Solo a Violino senza Basso accompagnato are really too demanding for background listening and won�t go down well at most parties. When you do decide to give your brain a treat however, you don�t want the troublesome nature of double-stops getting in the way. With Perlman you can sit back and be transported through Bach�s incredible musical journey as if riding in a Rolls Royce. I do have affection for a set which has also been around for some time, Ruggiero Ricci�s 1981 Unicorn-Kanchana recording, which, alas, you won�t find in the shops. �Each movement an unedited performance� is the proud announcement which went with the programme notes, and with some heart-stopping playing and the solo instrument suiting that Calrec �Soundfield� microphone to the ground I�d love to see this one back on the shelves. Despite one or two moments when editing has clearly been required, Perlman does have quite a �live� quality in his performances. He doesn�t go in for risk-taking as such, but while some critics complain about superficiality I find he digs deep enough. I think the problem lies in the consistent legato nature of his playing. This approach can have a tendency to smooth over climaxes and reduce the drama one might expect at some points. Listening from about 10 minutes into the great Chaconne in BWV 1004 Perlman does vary the articulation somewhat, but not nearly as much as some. He also seems to sit back on the tempo at places where you might feel the urge to press on in order to build tension. We flute players are of course madly jealous of the extended sostenuto you can do on a violin � we have to keep taking breaths � what a drag. Just listening to the expanse of the first Adagio movement of BWV 1005 will make most flautists faint. Perlman doesn�t give in to much in the way of abandoned joy in the following Fuga, but allows the music to develop and expand, giving it some of the weight remembered from the finale of BWV 1004. I am not so keen on the tight vibrato in the Loure and Gavotte of BWV 1006, which reminds me of the needle wobble I used to get playing records in a London house I lived in where freight trains passed on a regular basis. One can be picky, but in the end it all comes down to personal preference and taste. Competition there is of course, and some of the more revelatory recordings have come from the likes of Rachel Podger on Channel Classics, whose equally admirable technique marries with a foundation in authentic performing practice to great effect. Perlman need not elbow every version of these pieces from the shelves, but at mid-price can stand shoulder to shoulder with anyone in this repertoire. For any newcomers it will certainly be a wonderful introduction to some of Bach�s greatest works.